Check the original puzzle here. No. Color the squares as shown. Now each tile must cover a blue, a yellow, and a red square. 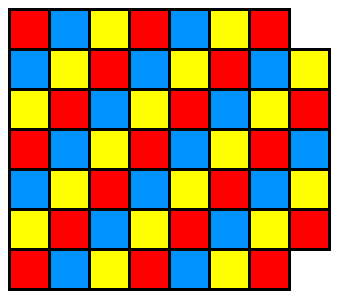 If we’re to cover the figure completely, then it must contain an equal number of squares of each color. But it contains 17 blue squares, 18 yellow squares, and 19 red squares. So the task is impossible.